The SRAM X1 1400 Eagle Crankset uses hollow forged arms making it both lightweight and super-durable. 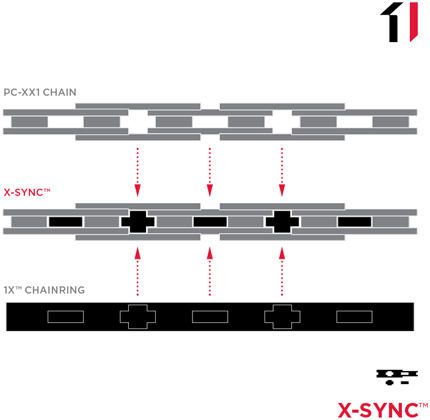 Featuring an X-Sync chainring. which ensures excellent chain control, giving you the confidence to ride hard on all terrain. The X1 crankset design from SRAM provides quality, durability, stability, performance and style every time you are out on your bike, without breaking the bank. Equipped with a SRAM X-Sync chainring, which features a unique tooth profile to ensure chain stability and virtually eliminate the possibility of chain-dropping, even over the roughest terrain. Hi, the buying options state that the crankset has a direct mount chainring, is it a boost chainring with the 3mm offset? This is not a Boost compatible chainset. The Boost spacing is provided by the chainset not the chainring.